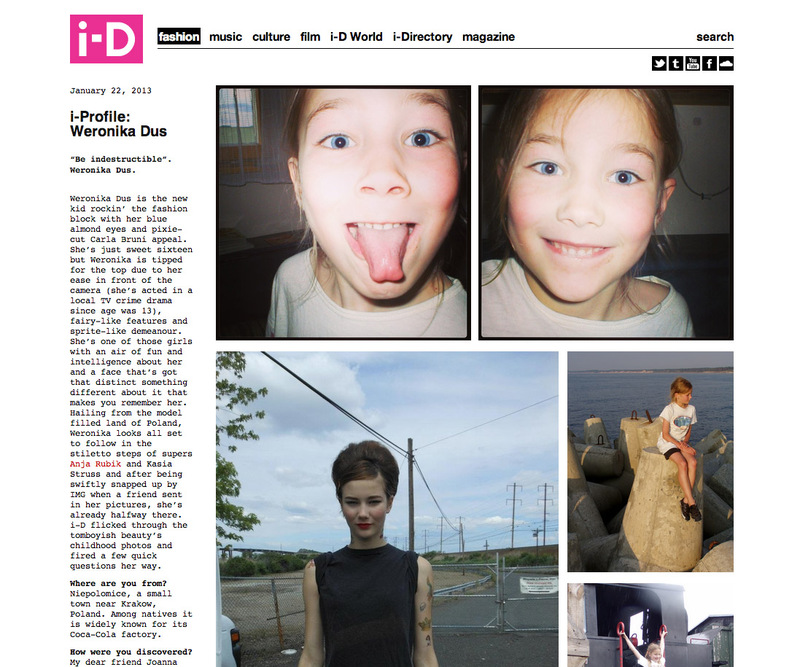 Weronika Dus dla i-D Magazine! Weronika Duś zauważona przez i-D Fashion Director Charlotte Stockdale! Zobaczcie jej i-Profile na i-D Magazine. Gratulujemy! Weronika Dus is the new kid rockin’ the fashion block with her blue almond eyes and pixie-cut Carla Bruni appeal. She’s just sweet sixteen but Weronika is tipped for the top due to her ease in front of the camera (she’s acted in a local TV crime drama since age was 13), fairy-like features and sprite-like demeanour. She’s one of those girls with an air of fun and intelligence about her and a face that’s got that distinct something different about it that makes you remember her. Hailing from the model filled land of Poland, Weronika looks all set to follow in the stiletto steps of supers Anja Rubik and Kasia Struss and after being swiftly snapped up by IMG when a friend sent in her pictures, she’s already halfway there. i-D flicked through the tomboyish beauty’s childhood photos and fired a few quick questions her way. Where are you from?Niepolomice, a small town near Krakow, Poland. Among natives it is widely known for its Coca-Cola factory. How were you discovered?My dear friend Joanna sent my pics to the agency. They called me and ask me and my mom to pay them a visit. What is your beauty regime? Nothing extraordinary – lots of sports, healthy diet, usual cosmetics and most importantly – SUNSCREEN. Why did you cut your hair? For comfort and change. Women like comfort. And women love change. Are you growing it out now? It’s actually hard to tell since it’s not really up to the model to decide! What was it like being a teenage actor? Very nerve-wracking, because all your friends and colleagues from school are watching much too closely and they will mercilessly point out every single thing they spot! If you weren’t modelling what would you be doing?I would design furniture, wallpapers (real, not virtual) and fridge magnets. What’s in your handbag?Probably a black hole, because I never seem to find anything I put in it. And also some very ordinary things like keys, wallet, Kindle, map of London, Oyster card, phone and headphones. What’s your favourite film? I could name a favourite in every single genre for every mood. If you could be photographed by anyone, who would you choose?Honestly I don’t know yet. Ask me in a year. What are your three rules to live by? Be indestructible. Be independent. Do my best to keep my commitments.